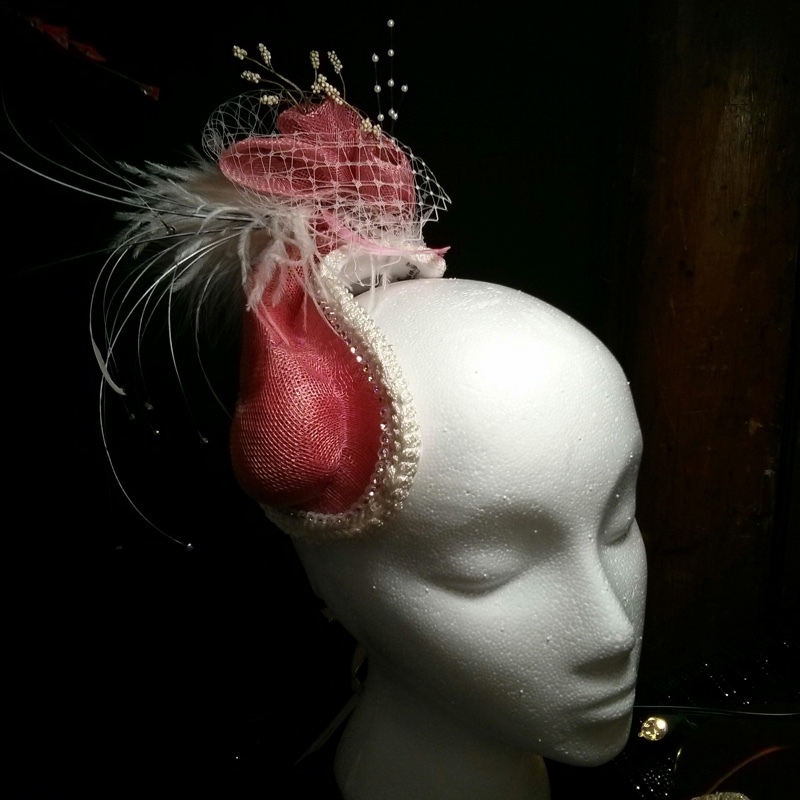 Created with a discerning bride in mind, this piece has a wire frame covered with man-made horsehair and lots of silk. The colours are stark white, soft winter white and gold. The design is contemporary and feminine. During construction Lori deliberated on the rich blue waters of the Artic, Atlantic and Pacific Oceans which have fed and challenged Canadians for centuries. As a Canadian, for Lori, red is the touch-stone of our current flag and it is powerful symbol of remembrance of the blood lost by and for us. To (mis)quote Dr Suess: ‘One hat, Two hat. Red hat, Blue hat’. 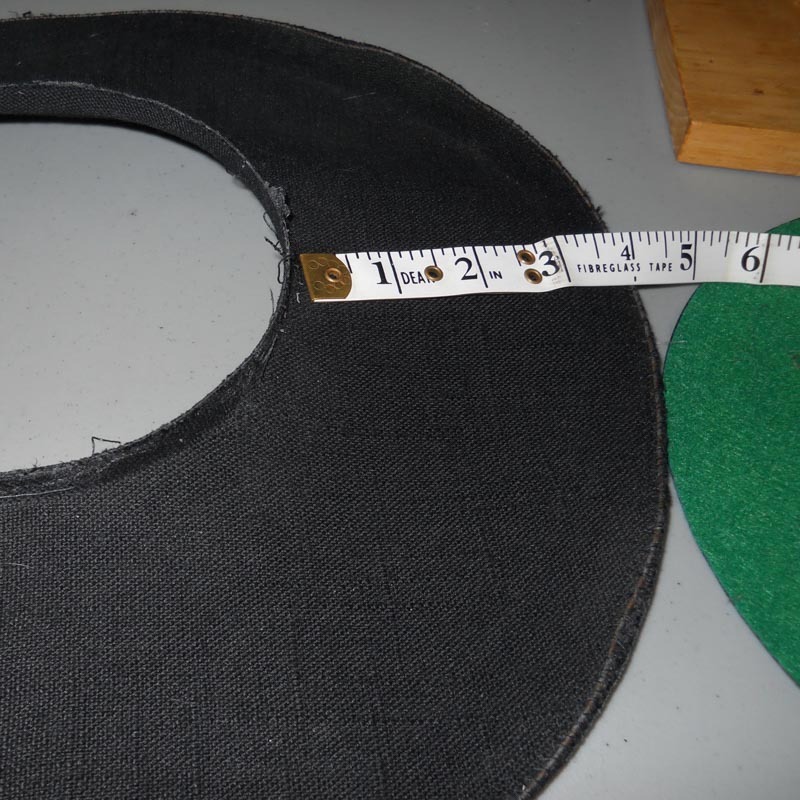 Look closely and these two hats exhibit examples of feathers hat-makers can use. 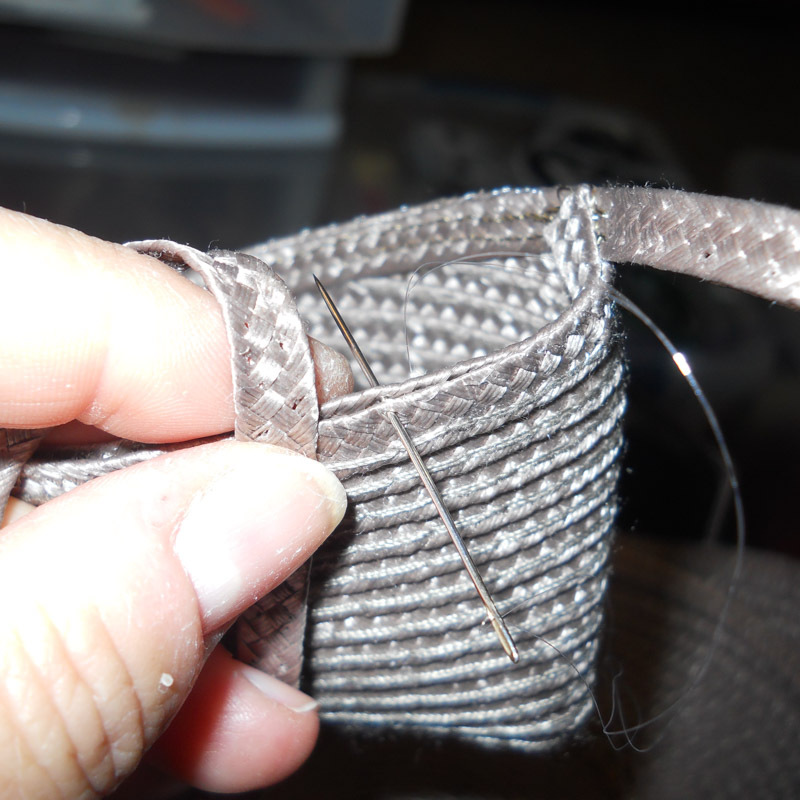 First, blue herl: look carefully and you can see these fine filaments on ‘Blue Royalty’. These herl are about 17 cm long. Second, red-tipped feeler feathers: the quills of long, slender coque feathers were stripped, leaving only the very end intact. 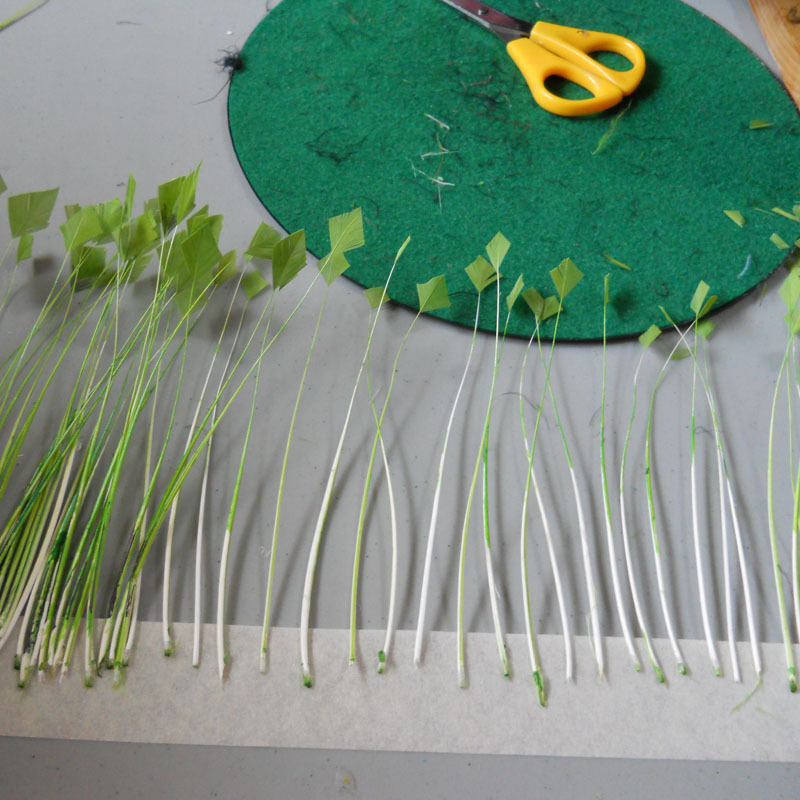 These quills are about 20 cm long. Third, there is a bright red crown of nagoire feathers, trimmed to echo the design in the red lace; they are about 6 cm long. What makes this hat unique is that it makes a sound! 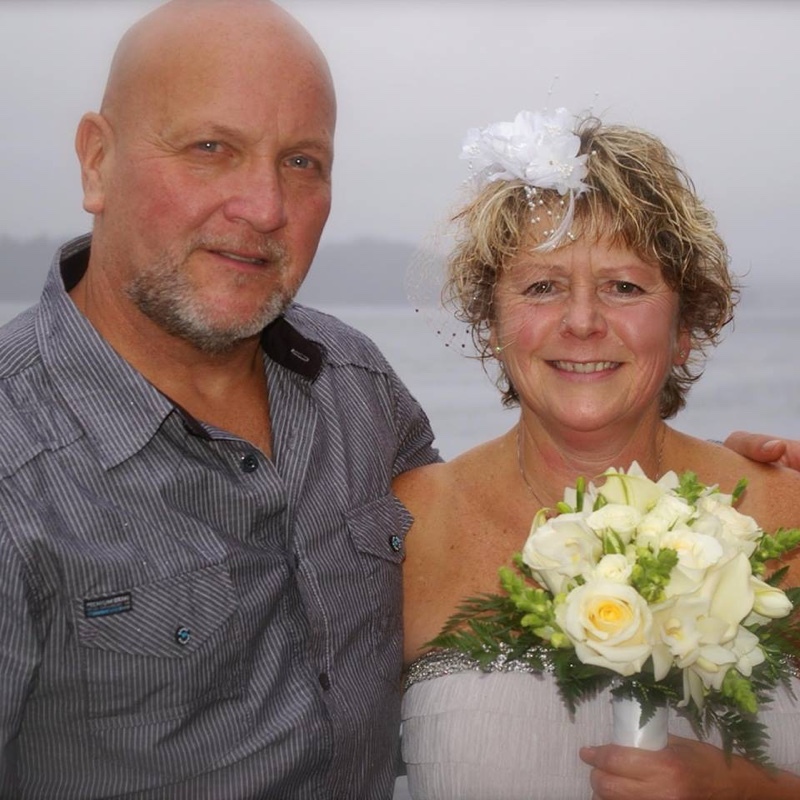 Lori’s intent was to honour Canadian wheat farmers, of which her family is one. The woman wearing this hat can truly hear the familiar, and gentle, ‘click, click, click’ of a prairie field during a breeze. Dreamy and airy. Soft and delicate. These are qualities we associate with translucent light colourings and barely-there allusions. Perhaps evocative to some, perhaps provocative to others; none can argue, this hat reflects Lori’s interpretation of ‘reverence’. 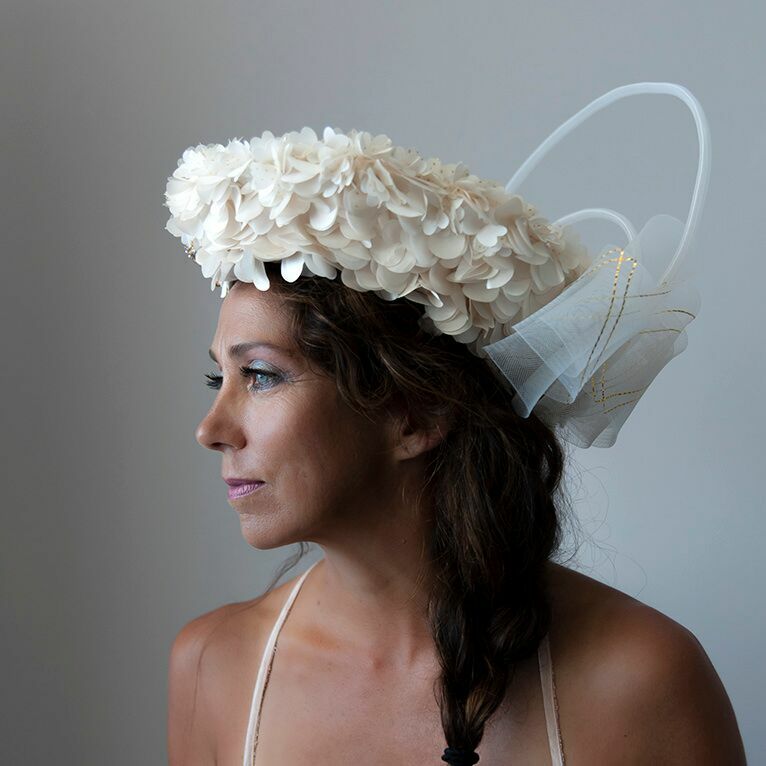 This hat is designed using beige buckram on an elaborate alice band decorated with a clutch of delicate beige feathers mounted with their quills pointing upwards. Each quill is tipped with a clear glass bead. There is a slight tinkling sound as these beads bump against one another. The “Hats don’t look good on me” statement is all too often based on a single experience of trying on the wrong hat. 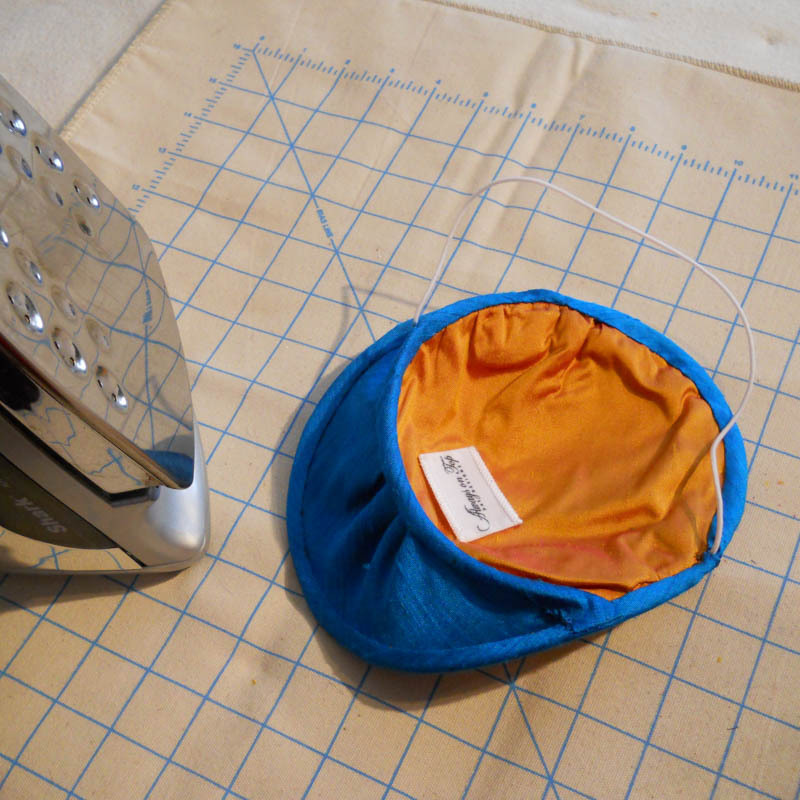 Create a brand-new paradigm for yourself by trying on a pillbox. 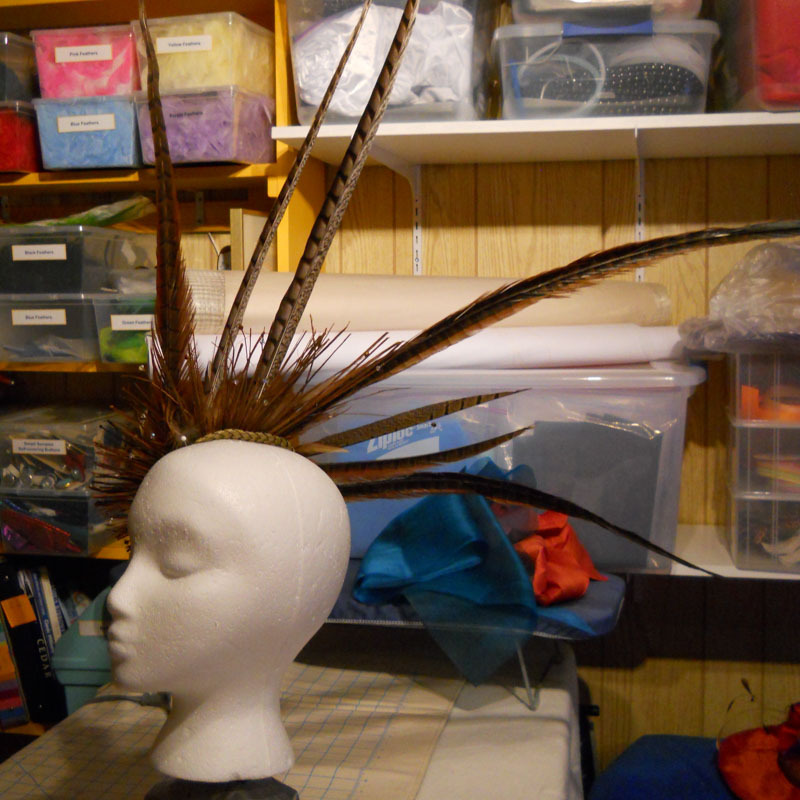 These can be simple or elaborate, custom-styled to your personality or outfit and they are adaptable to any hairstyle. In a pensive and restful pose, Mavi reflects the mood of this hat. Despite the bright colour combination, ‘Airborne’ was designed during a quiet period of introspection and wonderment of finding parallel lives. The base of this pillbox is small and compact but those pink feeler feathers will dance the night away. 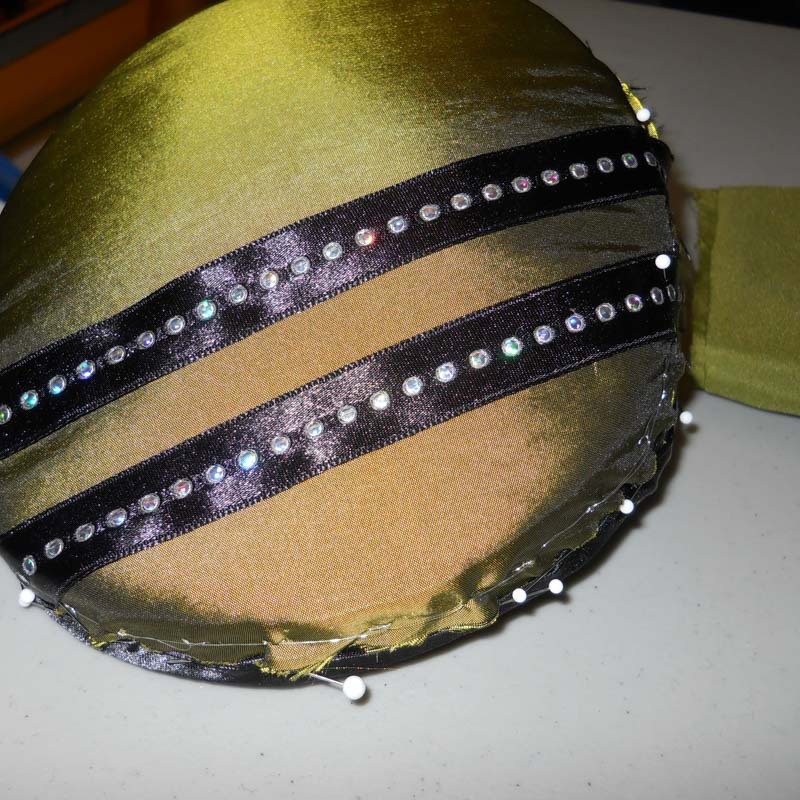 This hat is held in place with a hidden elastic which goes behind Mavi’s ears and around the back of her head. 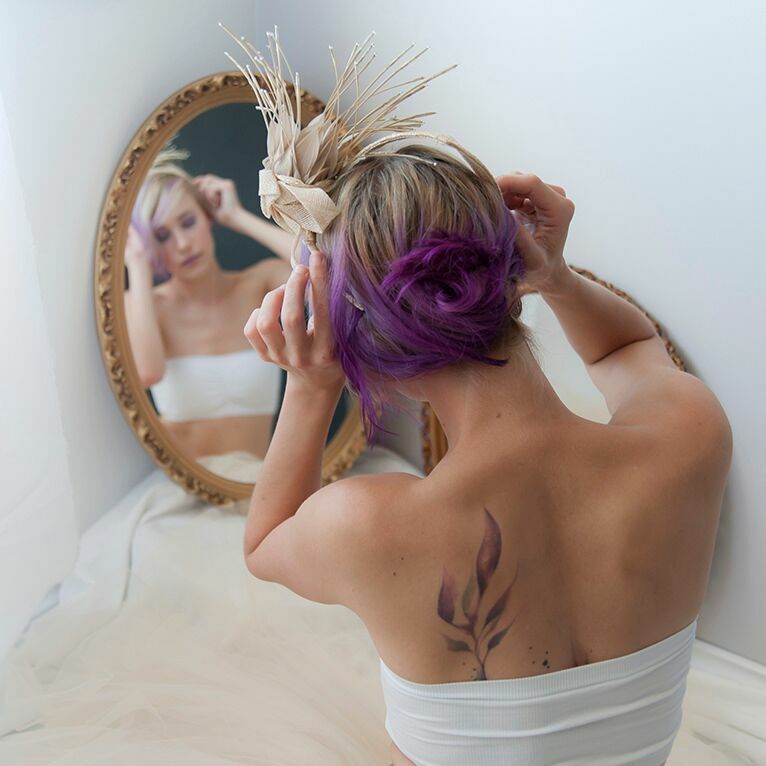 The message is, “Follow me… wherever I may go…” The monochromatic colour choice is meant to draw attention to the textures and materials of this headpiece. This display, during the Stagnhare Market event in Courtenay, BC, belies the challenges of shaping and wiring the sinamay over our one-of-a-kind wooden block. 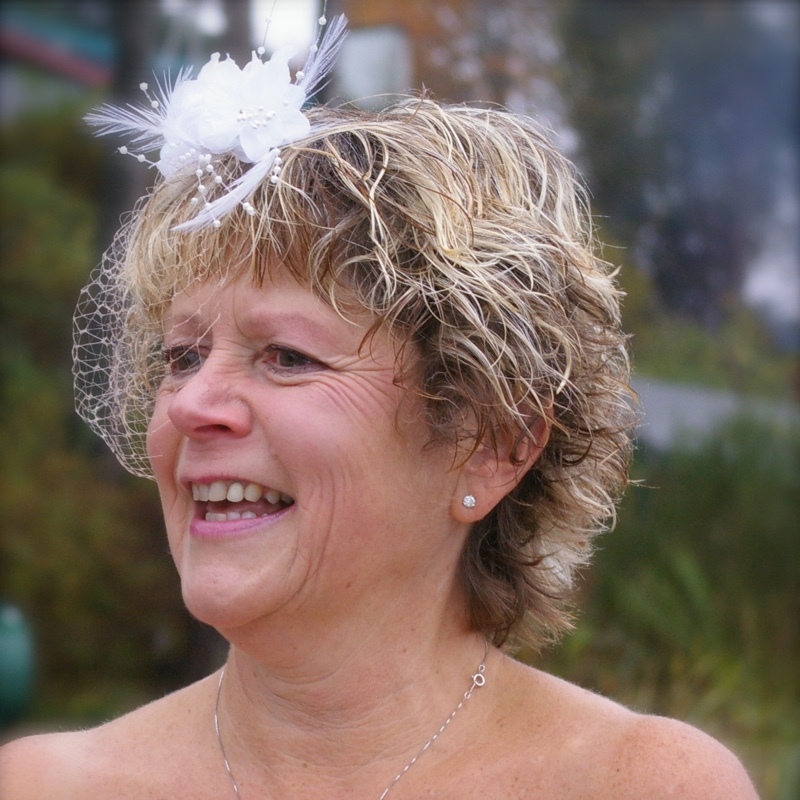 The original “Where To Wear It” event in Comox, BC, required a very special custom hat to match this customer’s dress. The long quill with silver balls at the very tip added drama and an element of the unexpected to her sheath. 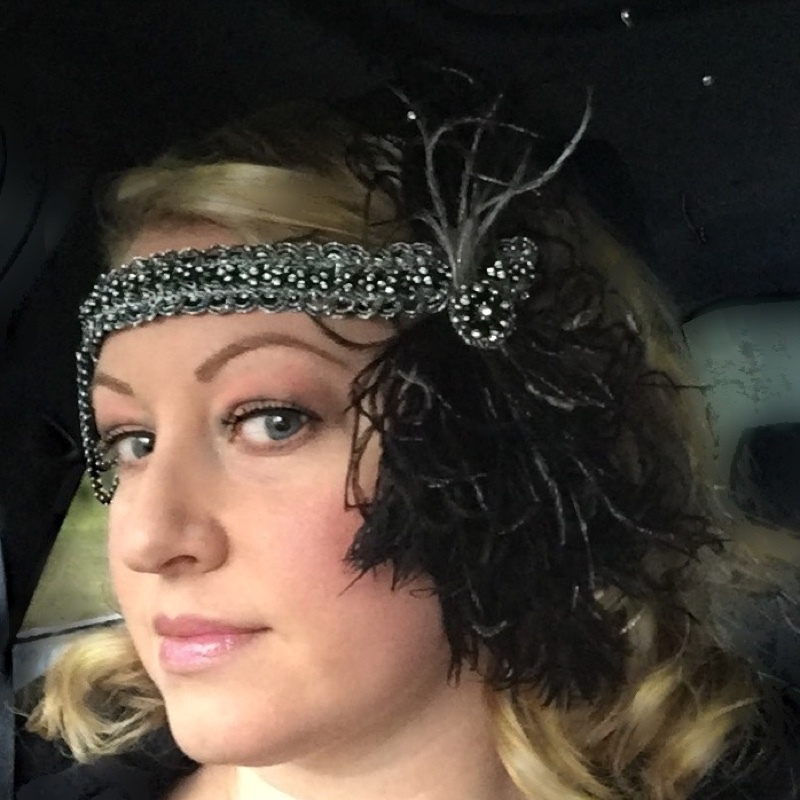 Flapper-style with today’s attitude, sparkles and movement were what Krystle envisioned for this custom band. We worked together to make this idea a reality. 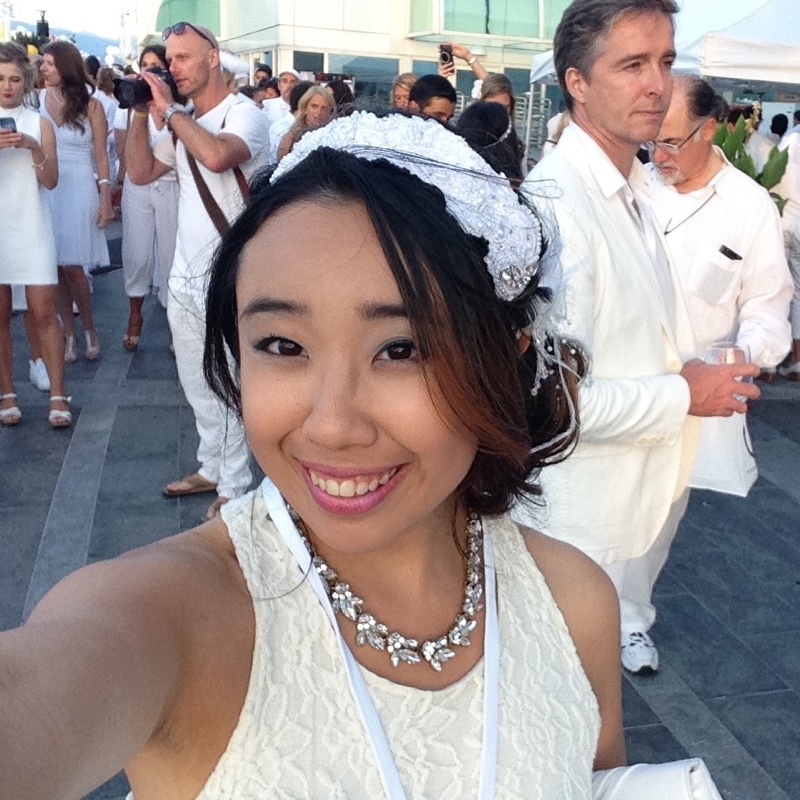 What fun to wear this lace, pearl and crystal piece for Diner en Blanc, Vancouver, BC. Blue sequins peek through blue sinamay (a specialty dyed grass) base, winking and sparkling at passersby. 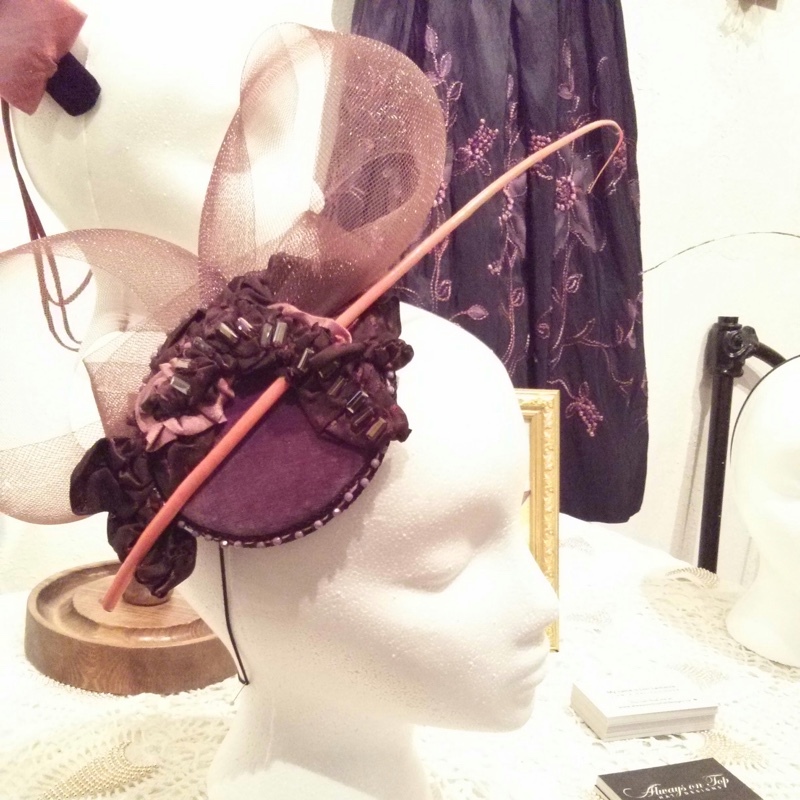 40’s tribute and today’s edge combined to create the perfect hat for dancing. 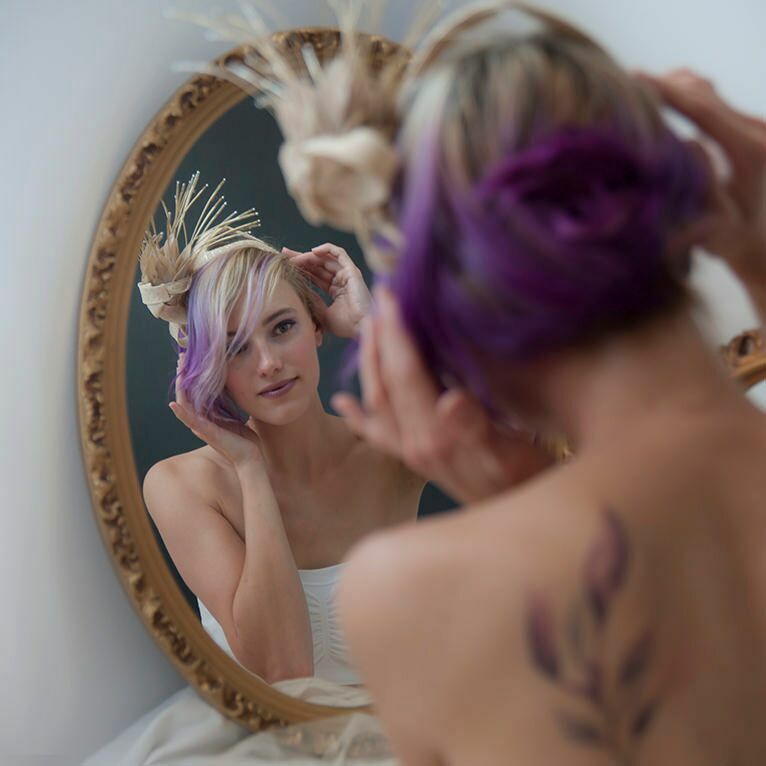 The feathers will sway to the music effortlessly. 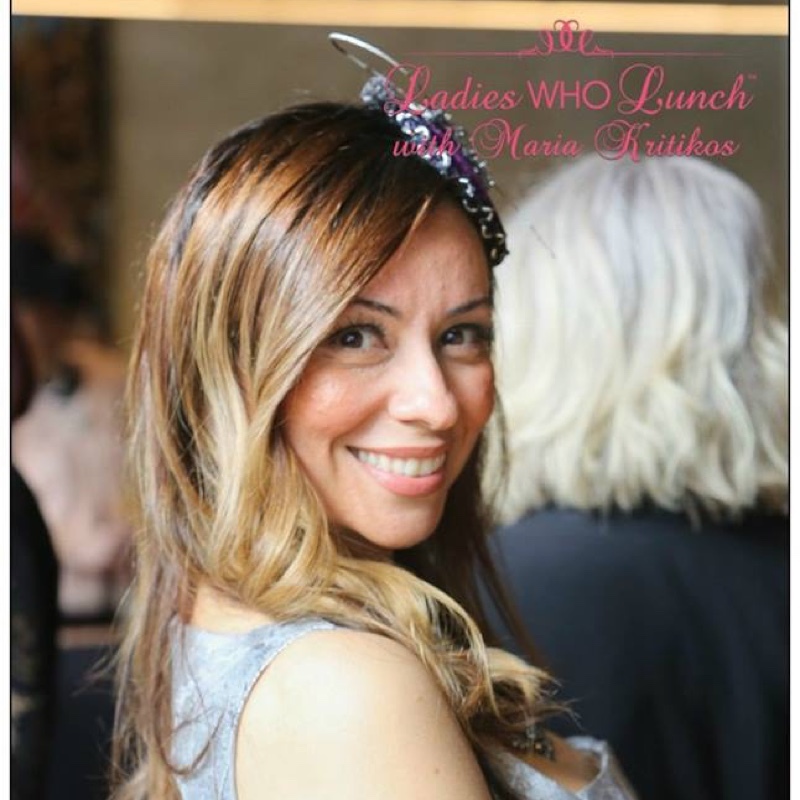 Ladies Who Lunch, Founder and CEO, Maria Kritikos models an Always On Top Hat Designs original. 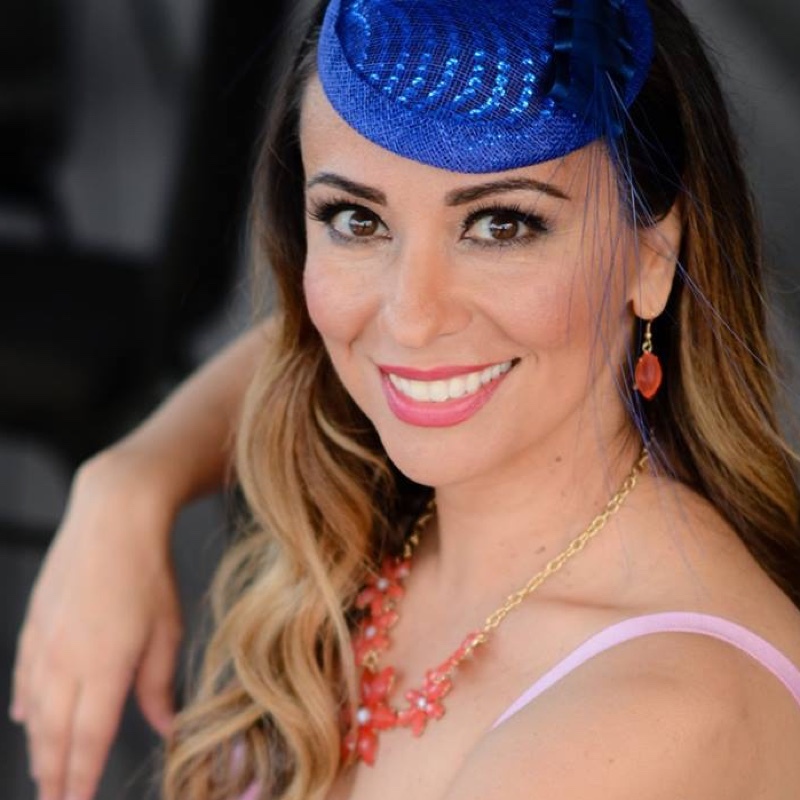 The blue undertones of Maria’s pink dress are accentuated with this bright blue headpiece. Eye-popping without a doubt. 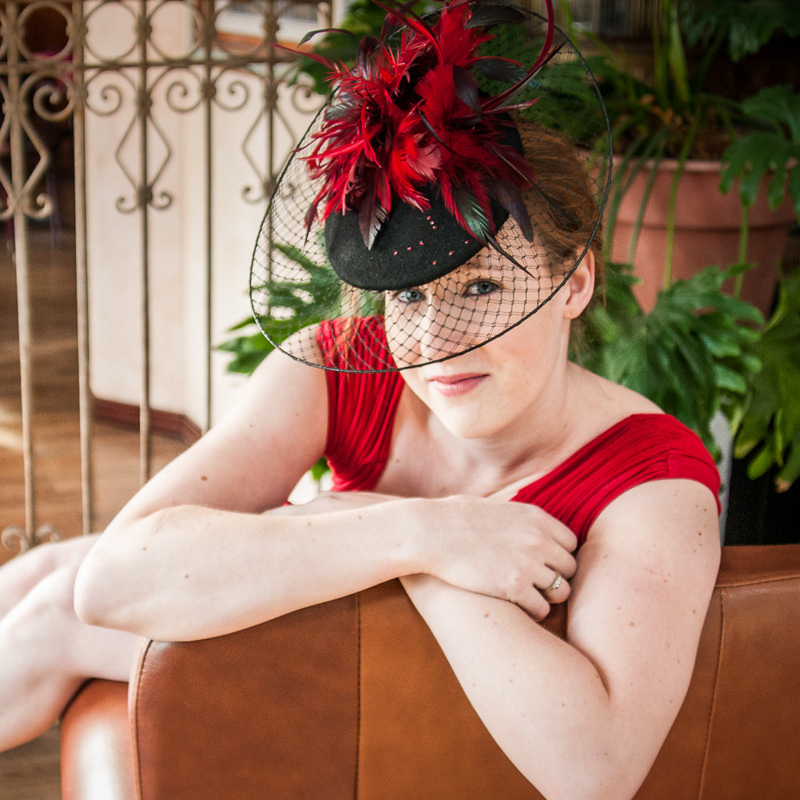 Maria understands how a small hat can dramatically and instantly transform a lovely outfit into a stunning ensemble! 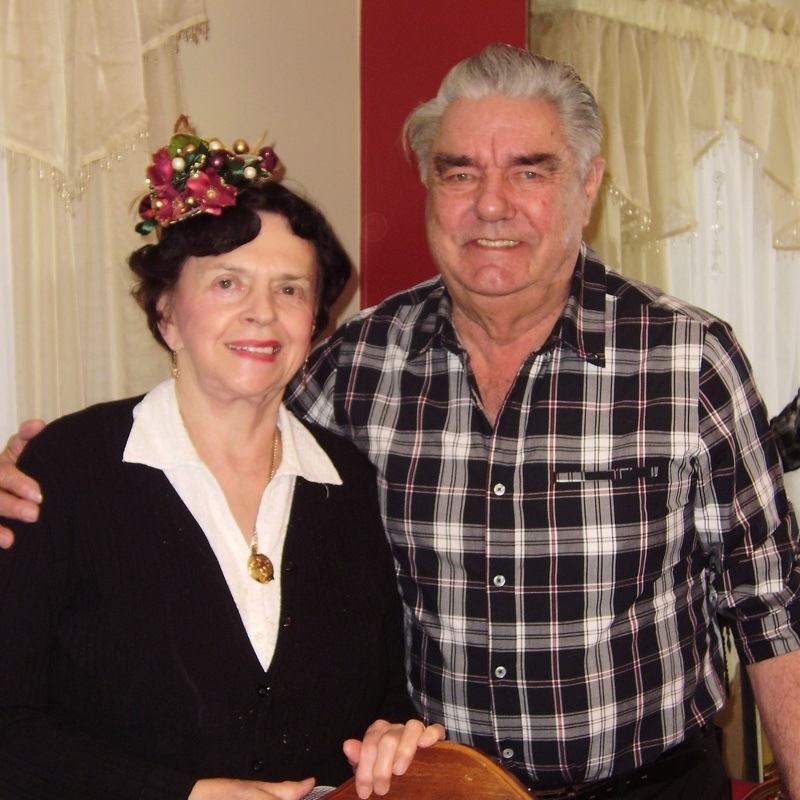 Dale and Malinda are celebrating their 50th Anniversary. 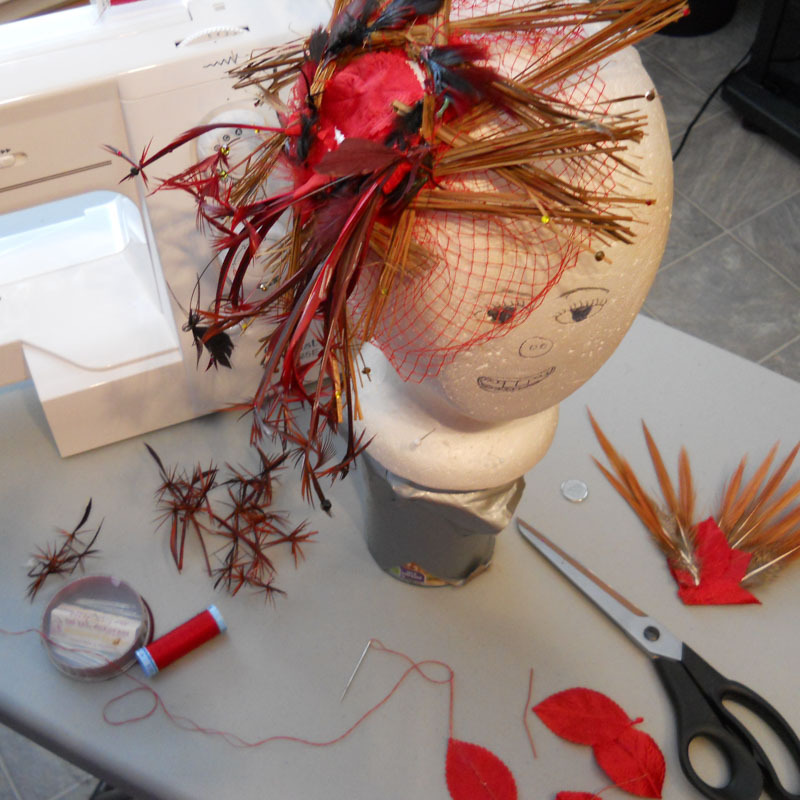 She is wearing a gold (50th) and red (colour of her wedding bouquet) fascinator. Such a wonderful couple! 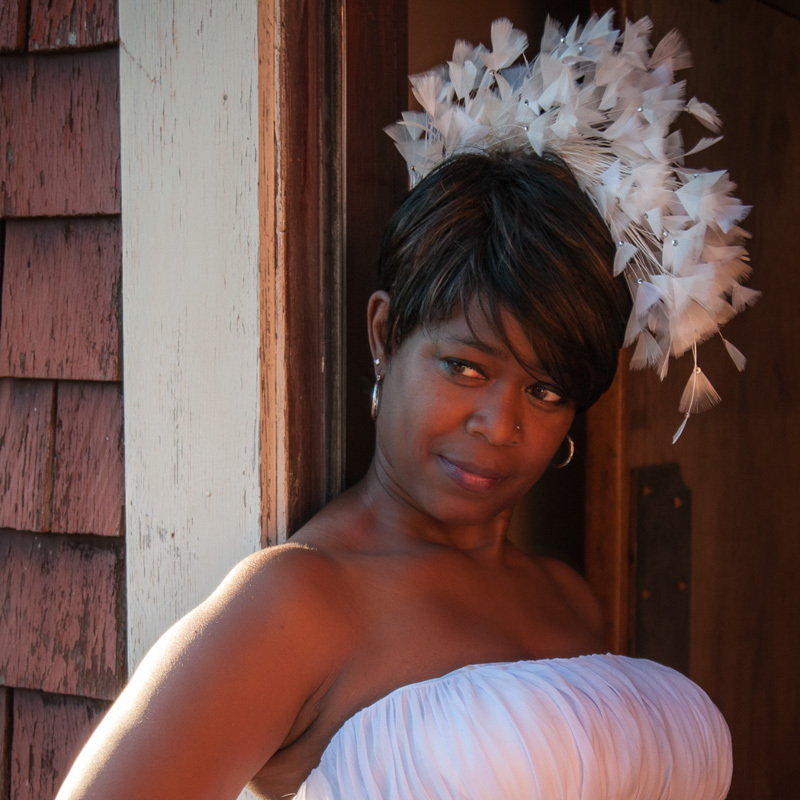 This bridal fascinator whispered happiness during Cary’s oceanside ceremony. The unpredictable flight of the extra-long feeler feathers gives the wearer a sense of flying. 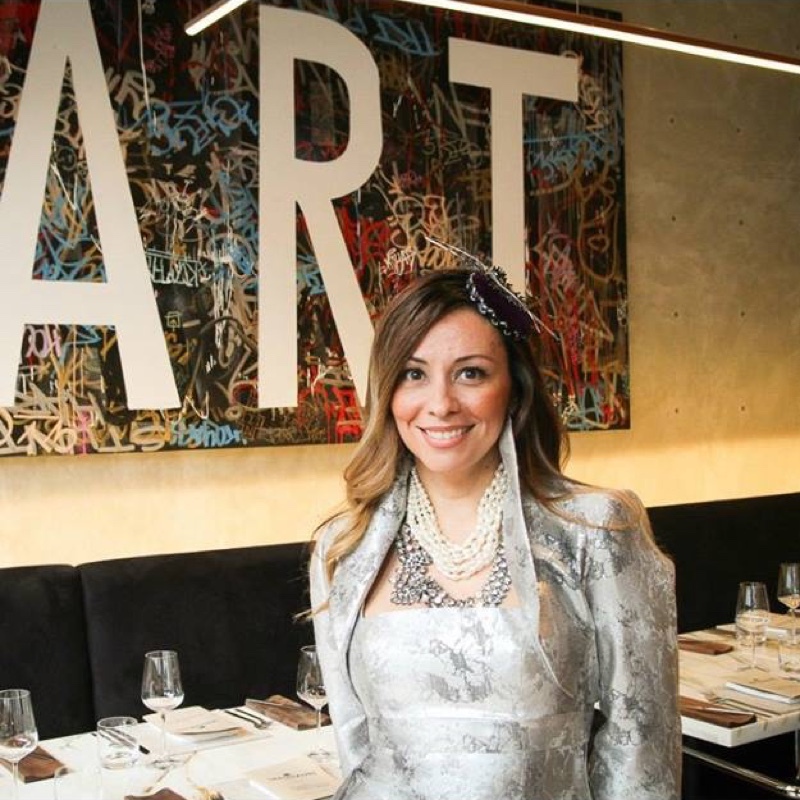 Maria, Founder of Ladies Who Lunch, wore “Harmony” to the Bauhaus Restaurant, Vancouver, BC. 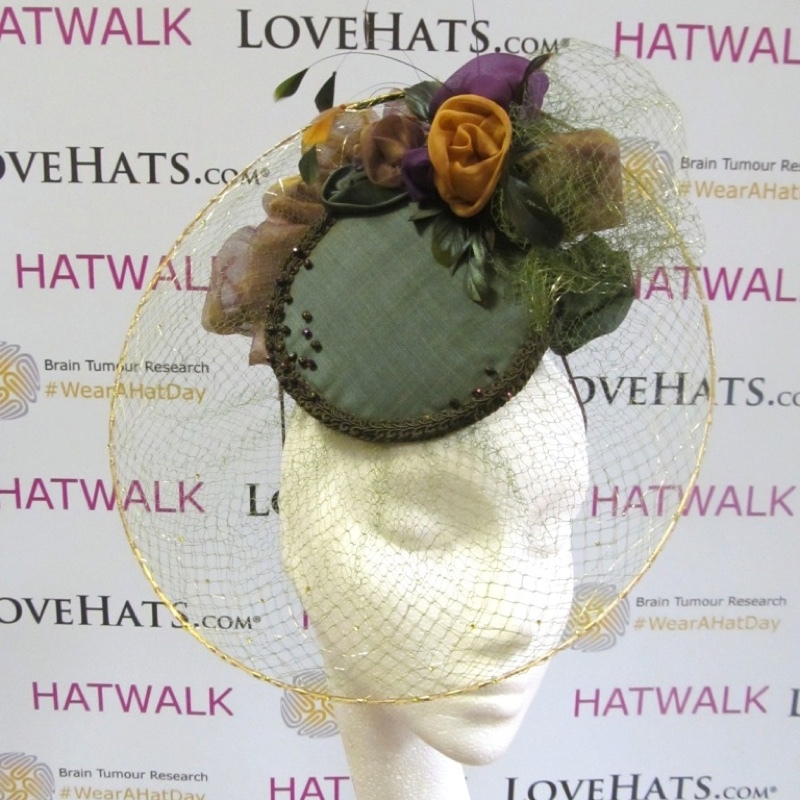 Proud to say this fascinator was a Finalist in the 2015 Hatwalk competition in Ireland. 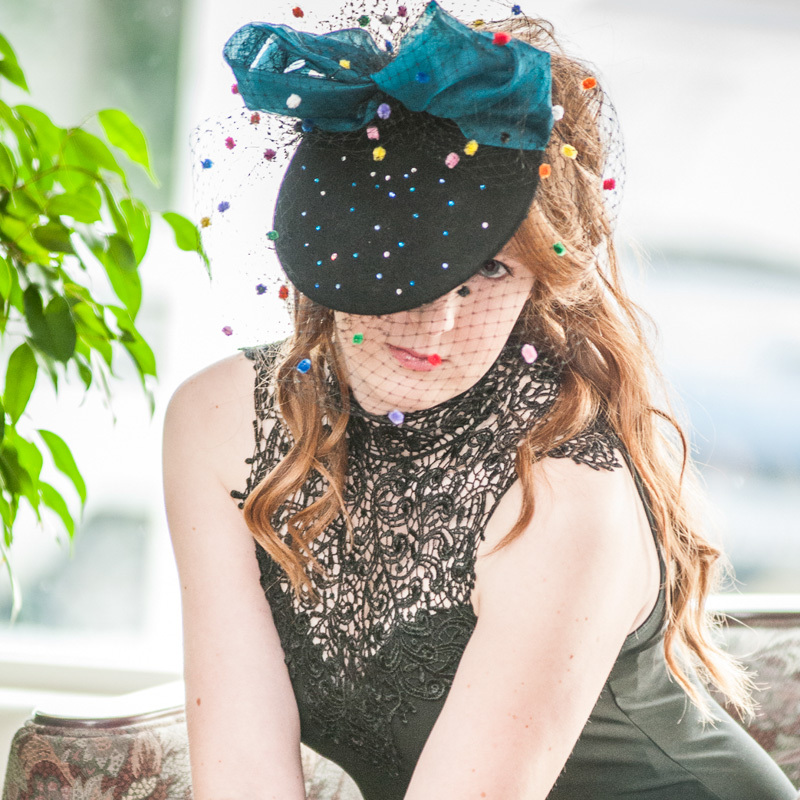 Bright floating colour balls coordinate with the chenille on the veiling of this hat. Party time at the Bauhaus Restaurant, Vancouver, BC! “Spirit Of It All” is a celebration of spirit, colours and mystery. “Harmony” brings the best in all of us, together. 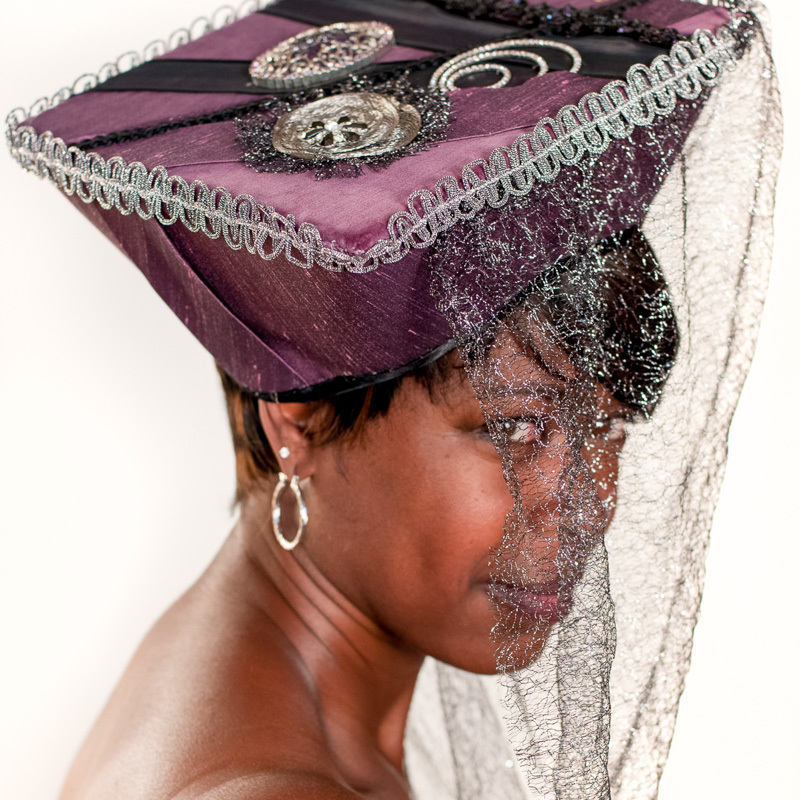 This piece is deep royal purple velvet with silver and purple accents. The combination of textures and glitz make it a real show-stopper. 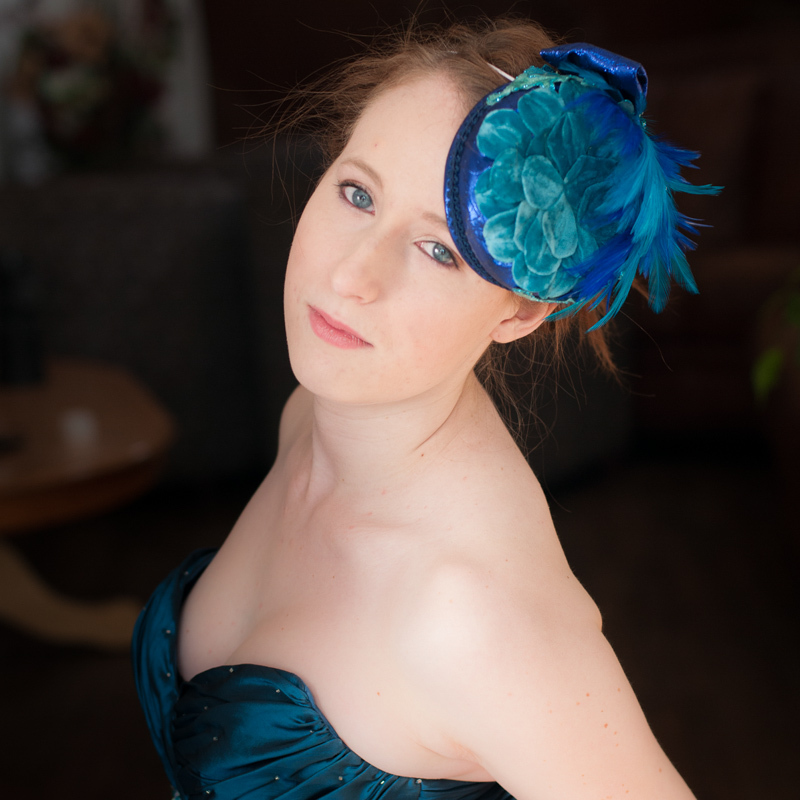 Kirsten needed a special hat to match a new dress. Her ensemble was a fashion hit with other travelers. 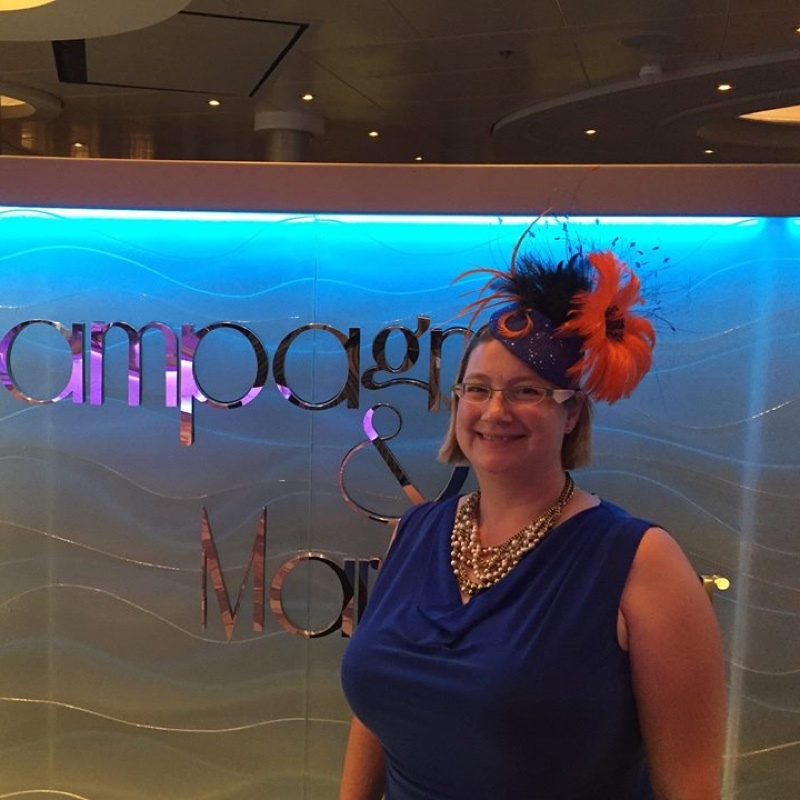 Cary asked for a delicate, custom headpiece which she could wear for other occasions. She got what she wanted. 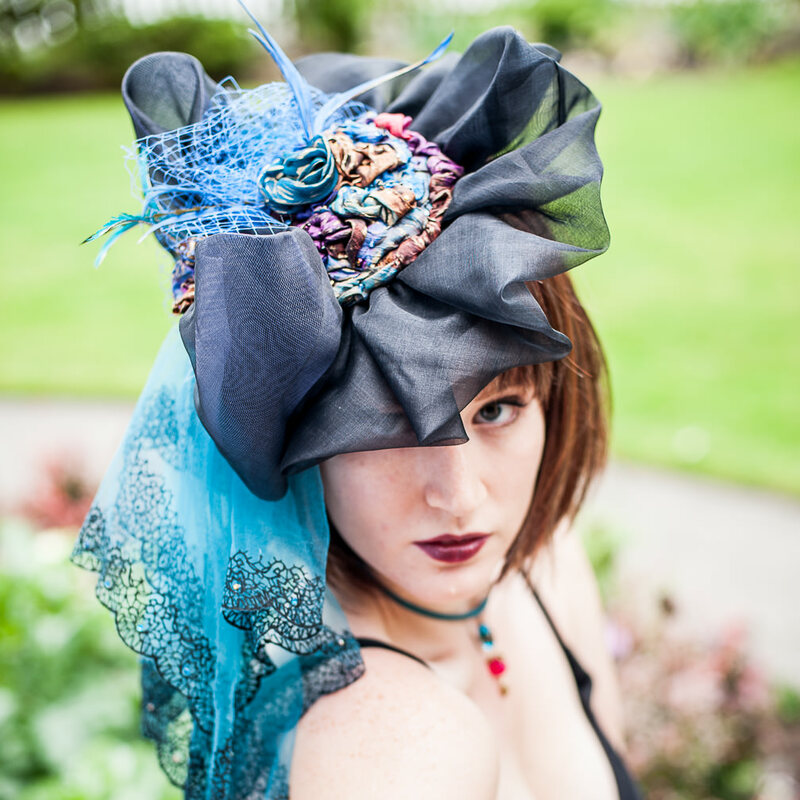 Racy, edgy, Spanish-interpretation hat for a woman who is ready to celebrate life on her own terms. We, who were present, were taken by the movement of the headpiece - the crystals and feeler feathers actually danced in the breeze. This piece is a visual arcade: a cascade of fluttering feathers and sparkles of light reflecting from a myriad of sequins. Perhaps New Years Eve…? 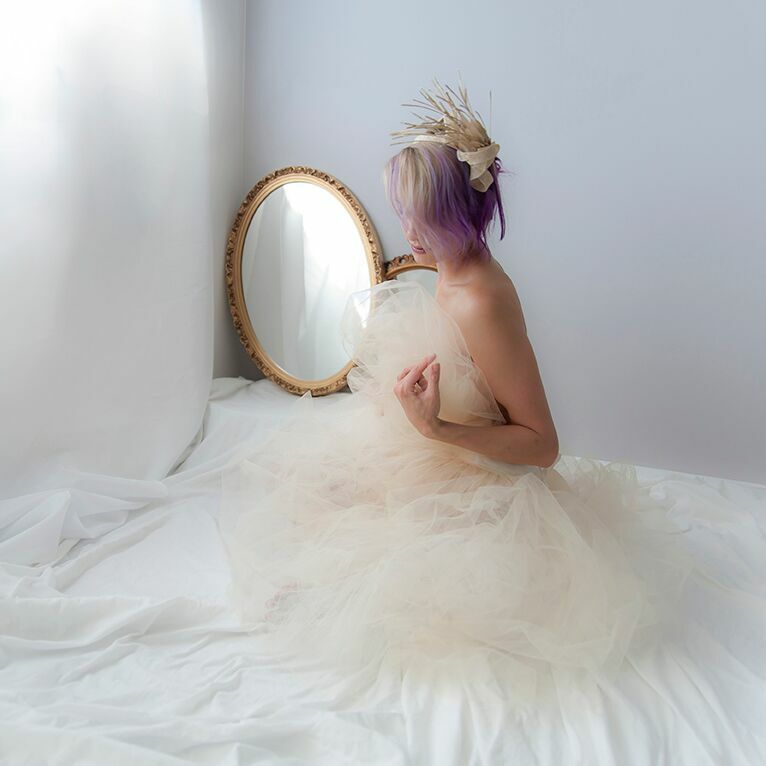 Named after Lloyd Scarff, a student of fashion,this is my couture interpretation of our natural surroundings, using one of our best known Vancouver Island resources, cedar. 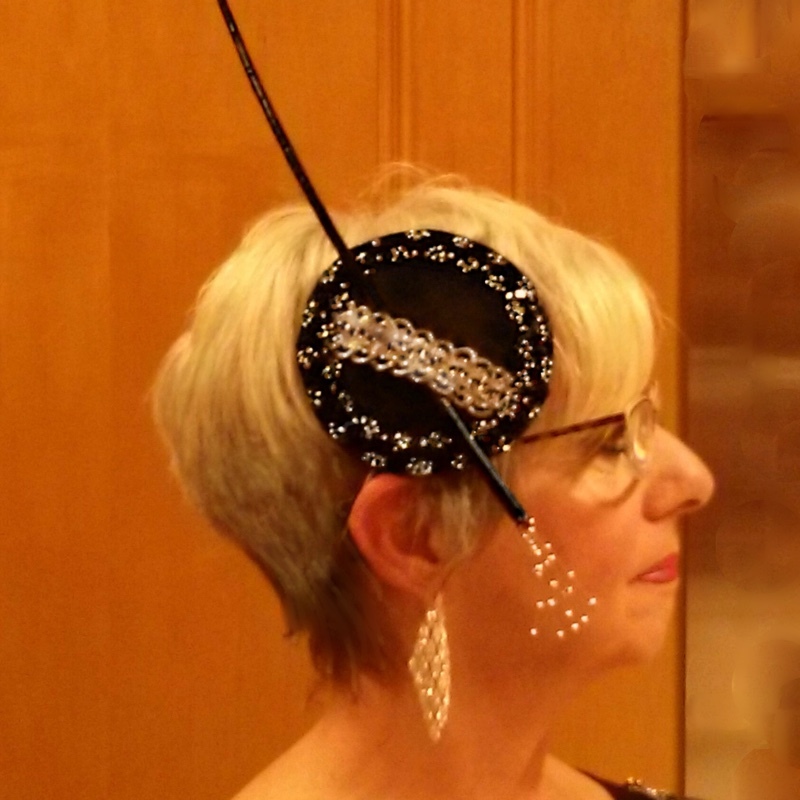 This fascinator is perfect for a night out à la pizazz. 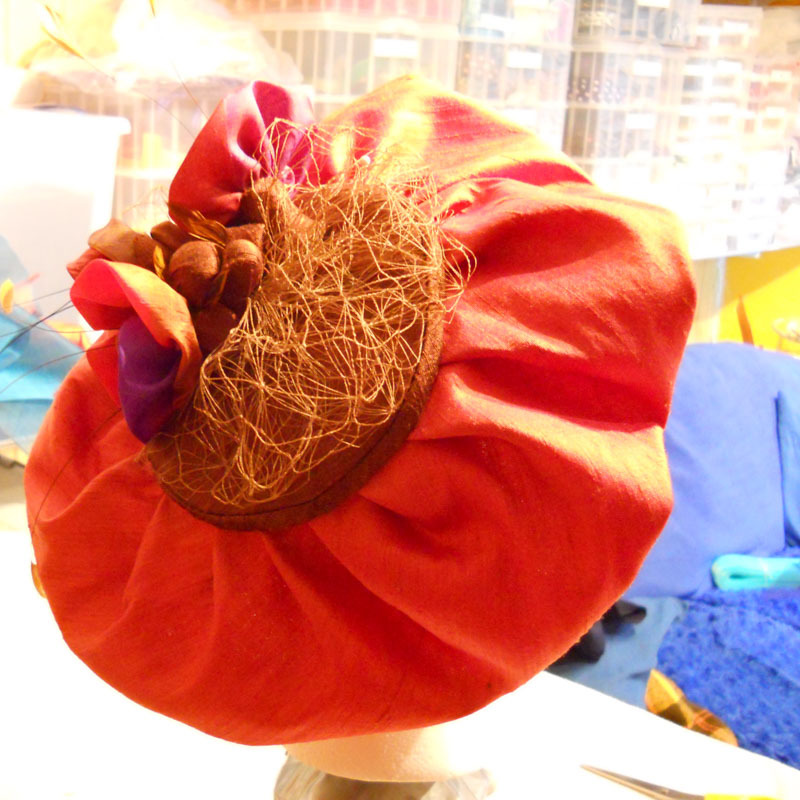 The shiny beads inspire the silks to POP! 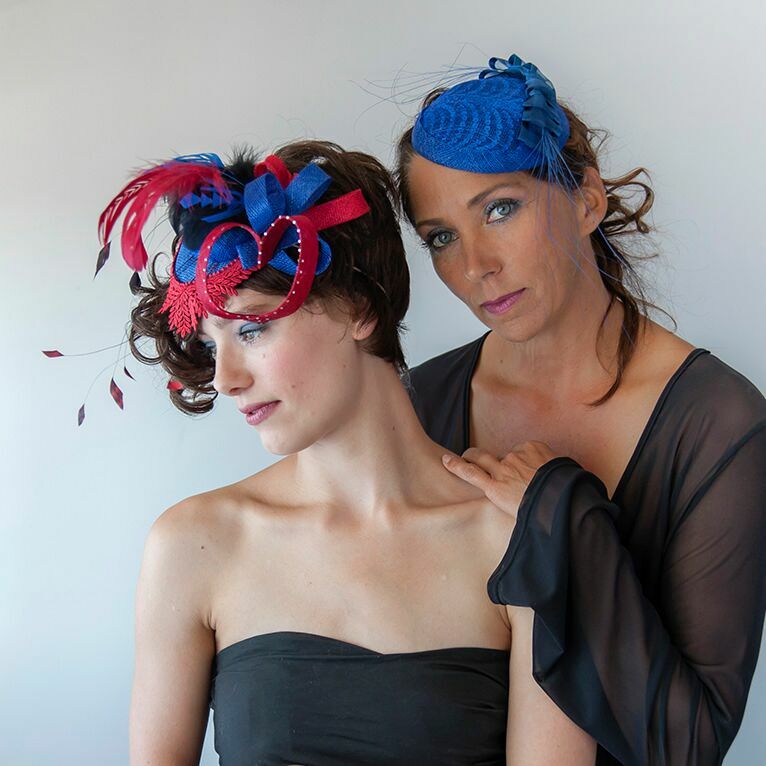 This hat is meant to be worn very low, over one eye – for an outré couture, flirty look. On this fascinator, hidden among the imagined tall fields of healthy crops is a wee bejewelled frog. 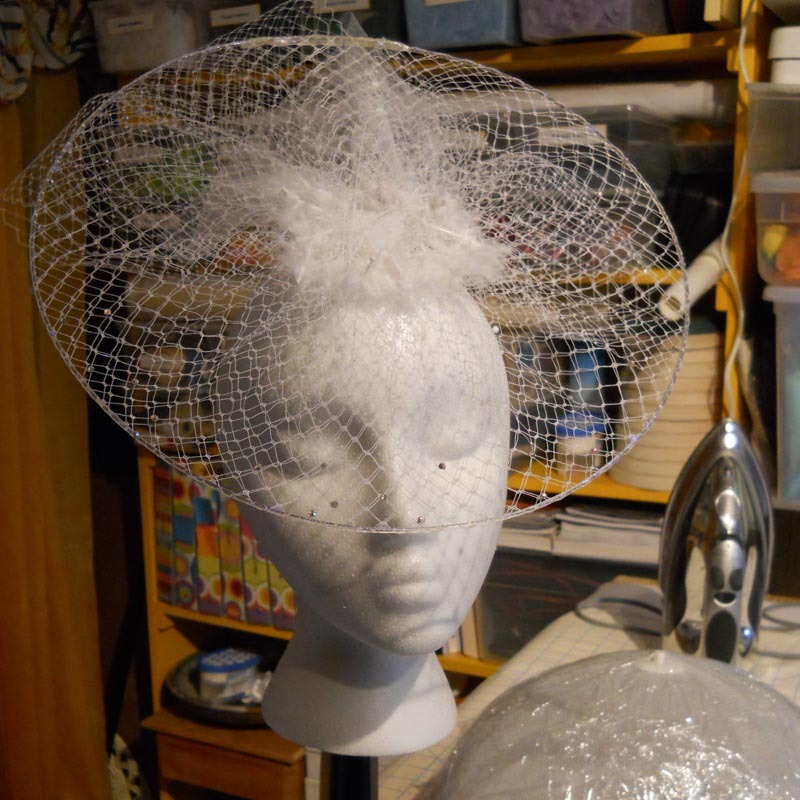 The circular pieces contrast with the square crown, the uber-modern veiling stands out against the traditional duponi fabric; somewhat mirroring how differences between people can evoke the best in all. 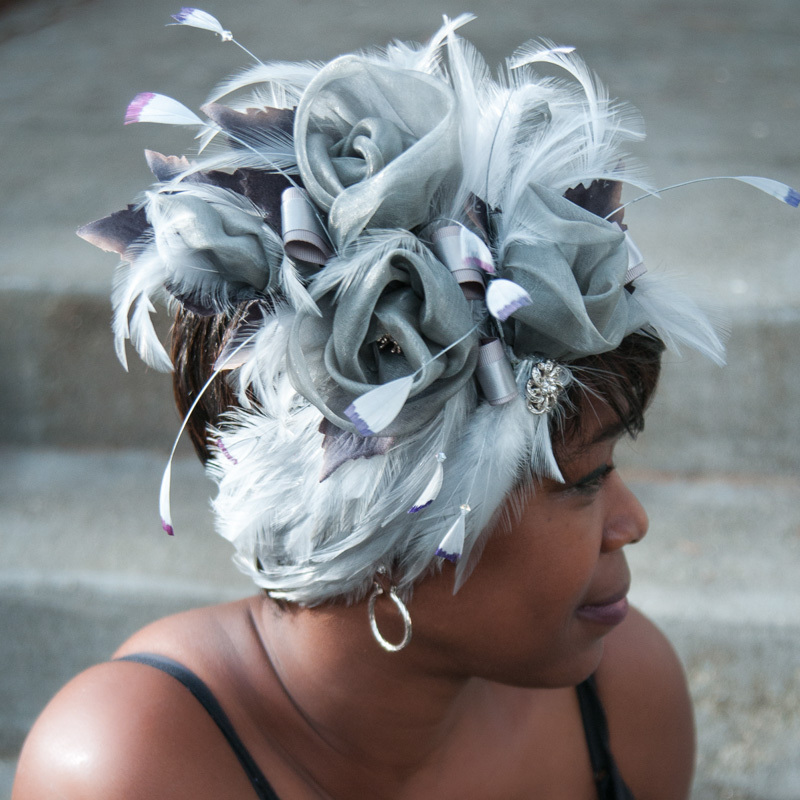 Repose and allure peek through this most unusual veiling, while the feathers and buttons quickly say “come hither”. This pillbox mimics the dangerous-yet-beautiful messages we sense from nature. 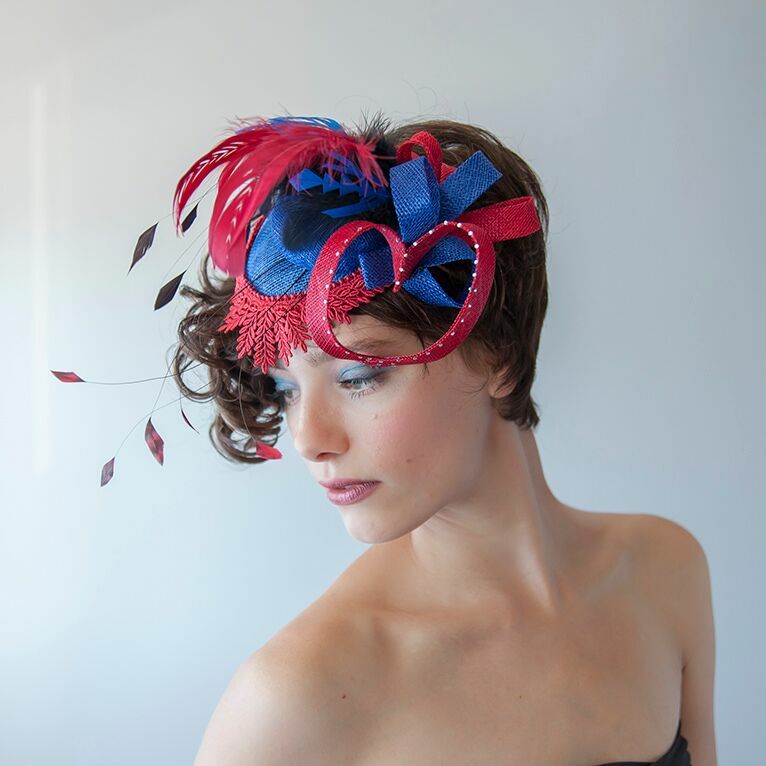 Black base with stretched netting, coquille feathers, twisted biots, coque tail feathers and red crystals. This piece conceptualizes and recognizes all those who have plied our west-coast waters for centuries. Traditional in every way: easy to wear accessory with a low profile. Casual and understated: perfect for a woman who might be wearing a fashion hat for the first time. A ring of green rolled roses barely prepares the viewer for the pent-up thrills of the other trimmings. Built to honour our Comox Valley spring-time gardens – greeneries peeking out of rich black soil. The traditional silhouette soothes those with a vintage quest, but the non-traditional materials excite those looking for glitz. This design came from a dream; a wee goddess hidden in the grasses along Nymph Falls, waiting for the full sunrise before dancing in the full light. A selection of feathers top a black veil. This ode to birdlife blends into the forest as easily as it stands out in a crowd of well-dressed women. 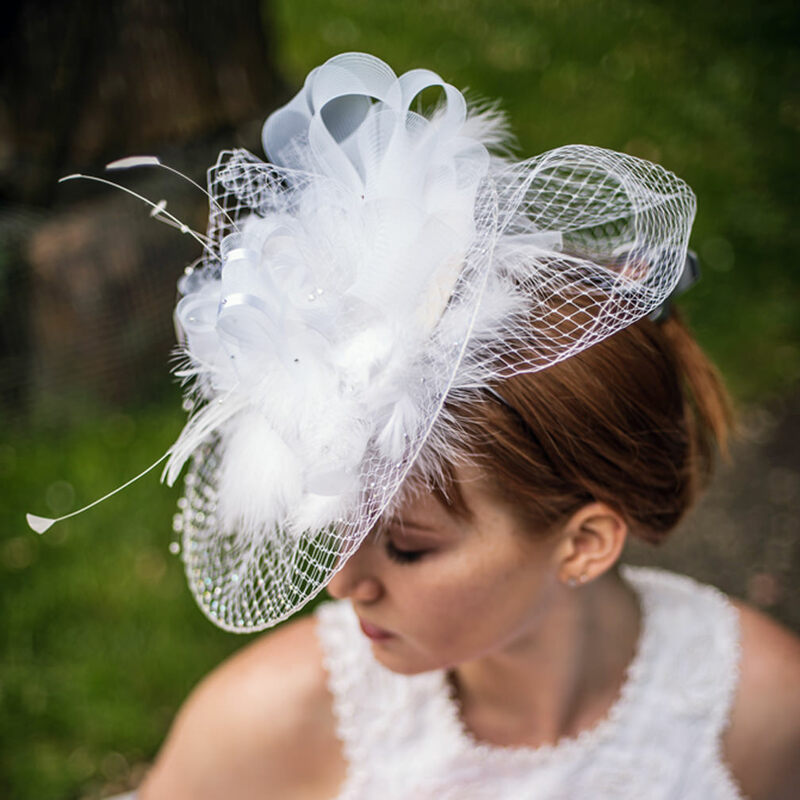 This piece embraces the head while the feathers dance with a breeze, reminding the lookers-on that the woman wearing this hat just might be an angel in disguise. 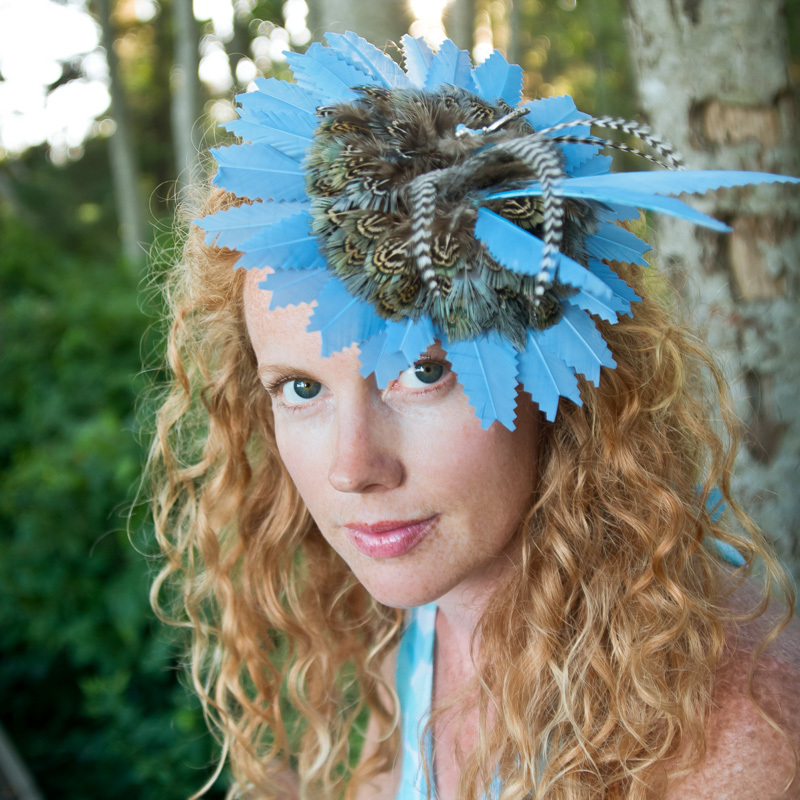 Trimmed feathers radiate from a grouping of blue/grey feathers and a bejewelled dragonfly. There are 38 species of dragonflies in the Comox Valley; my design hints at the mystic of the Blue-eyed Darner Dragonfly. Named after Lloyd Scarff, who harvested cedar for this hat in 2013. 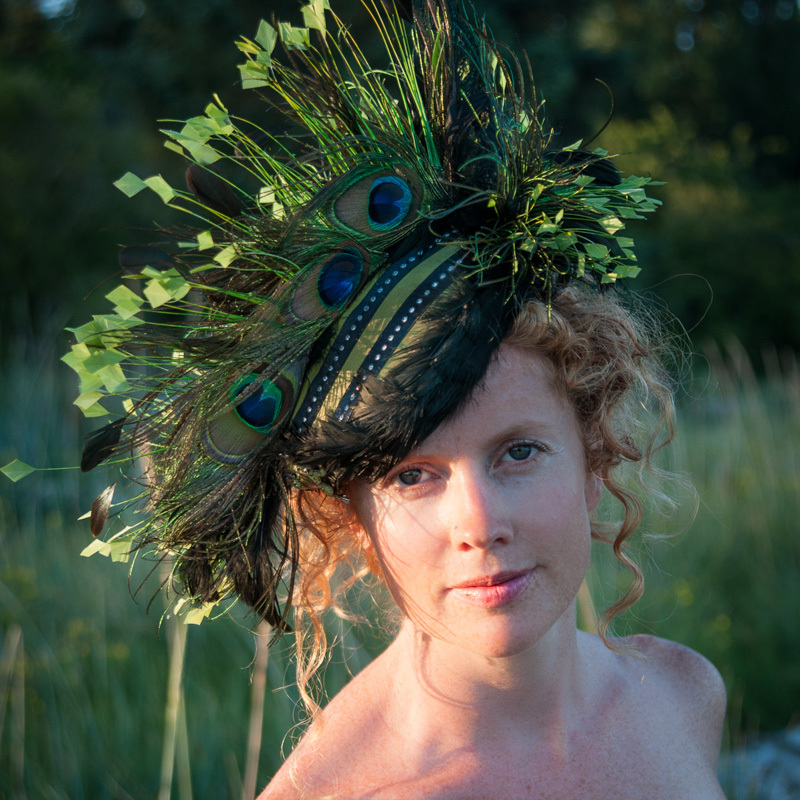 This is my couture interpretation of nature; using one of our best known Vancouver Island resources, cedar. I have been inspired to design this haute piece de resistance by the lazy summer nights relaxing on the beach with friends at Goose Spit, Comox Valley. 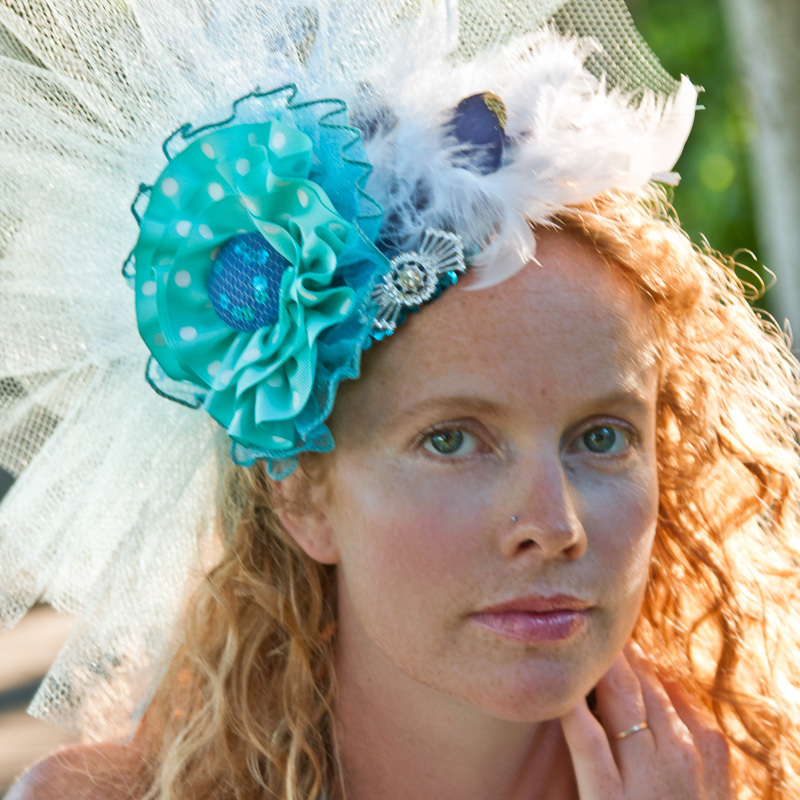 White polka-dot ribbons with netting and feathers in various shades of blue. Just as a soft glows wisp through our West Coast fog on fresh mornings, the sun gently warms a halo over the wearer of this gently textured topper. Stripped white feathers with crystals. 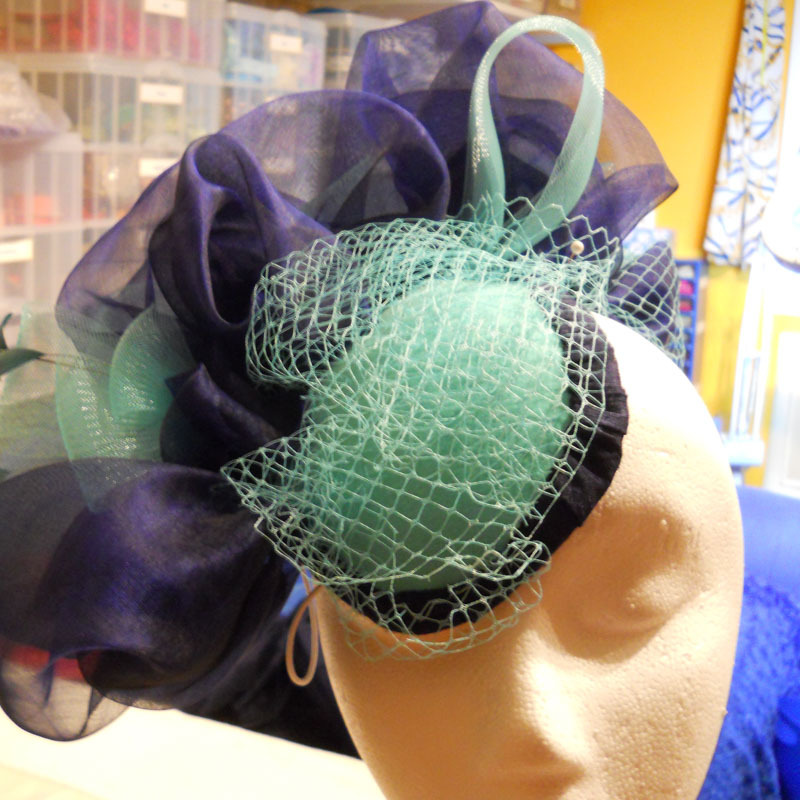 This is a teaching piece created with my mentor, William (of William Walker Millinery), for myself. 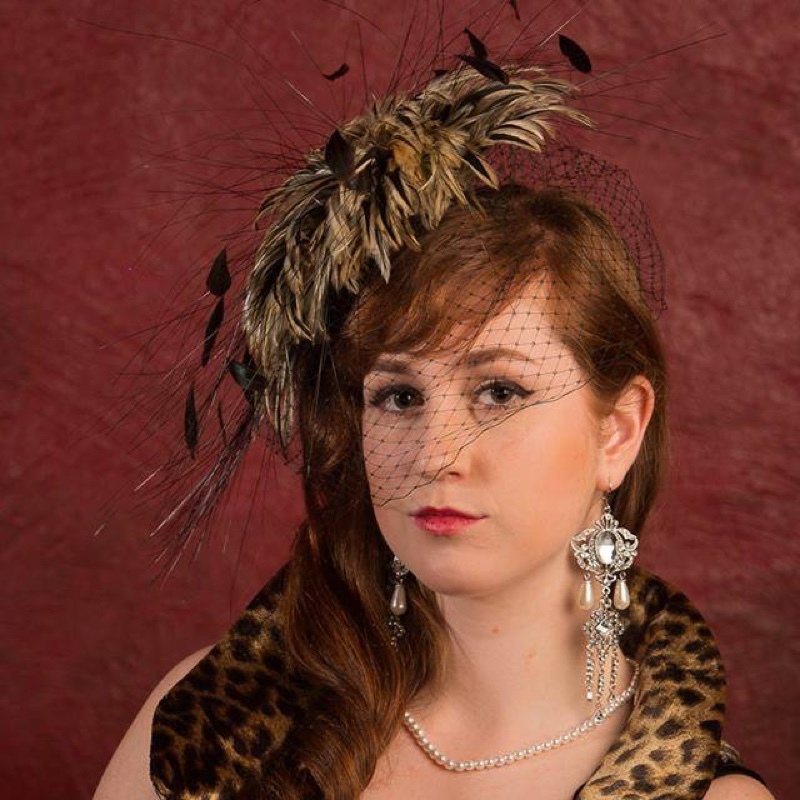 My fascinator is a reinterpretation of one worn by Princess Beatrice a few years ago. This piece pushes the boundaries of traditional art and represents the mystery of the salmon runs which have continued for centuries. Gifted to Diana Krall. 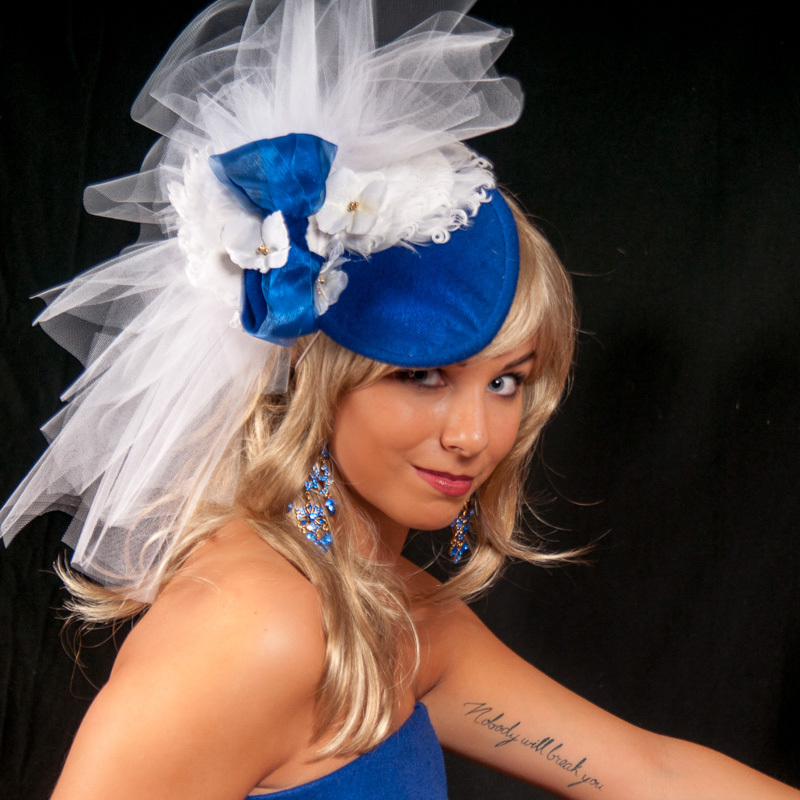 Rich, deep blue felt and whitest white veiling, tulle and trimmings. About 16 inches. 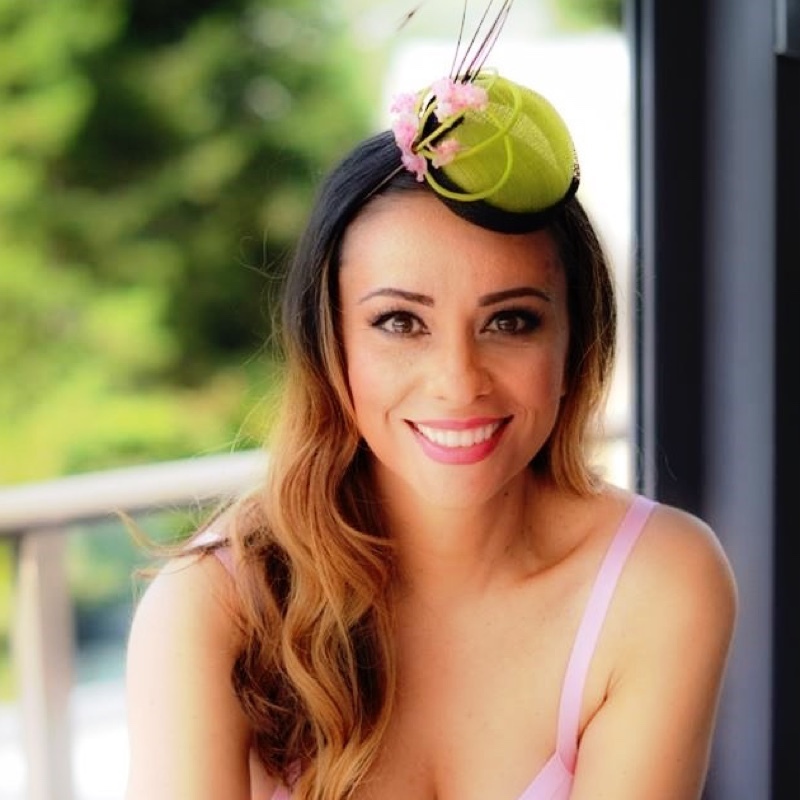 Fancifully simple, boldly lady-like and quietly meant to be noticed, this fascinator design draws out the mystery and mayhem usually hidden within. 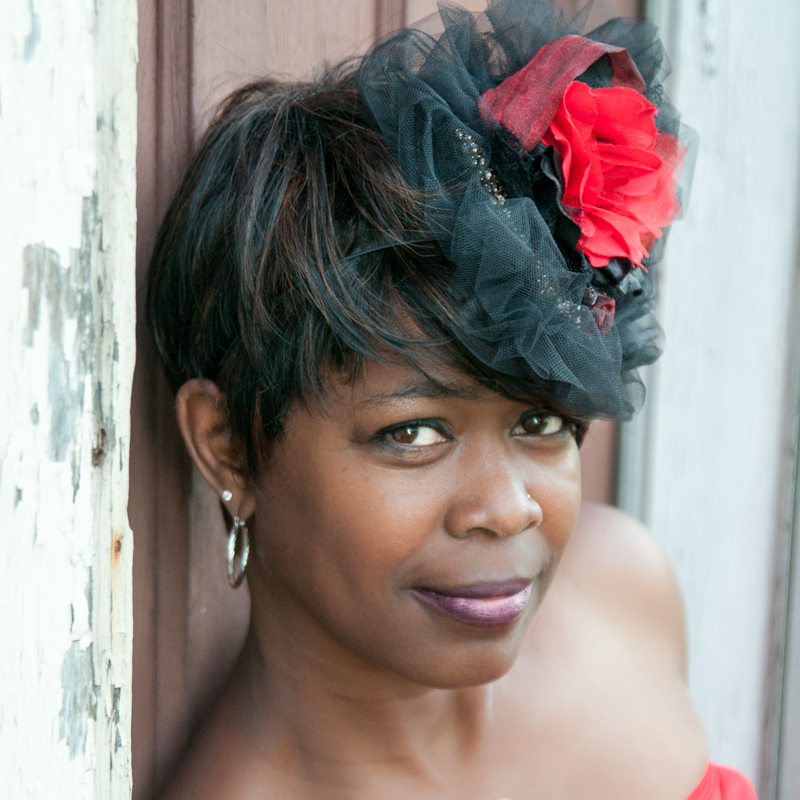 "The feather gives to this red hat its wings to fly." 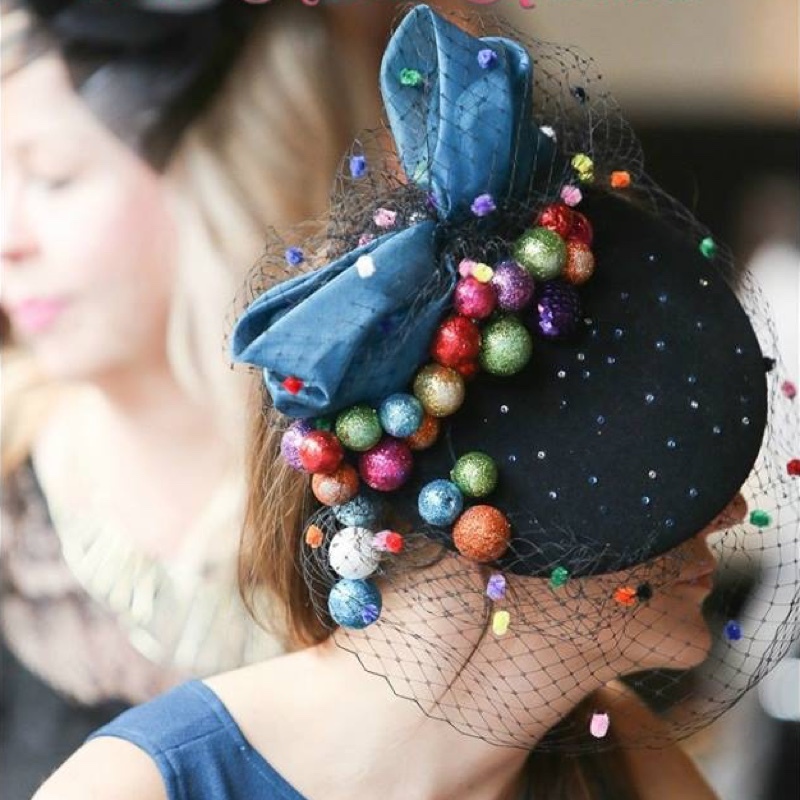 "Hats are a great antidote to what's going on. It's really their purpose to put a happy face on a sad world." "In difficult times fashion is always outrageous." "And finding the hat, I always like to find the hat. And then props just dress the set. It's all fabulous." "Women who love hats don't get jealous. It makes them happy to see a hat that looks good on someone else. Women who wear hats know who they are." 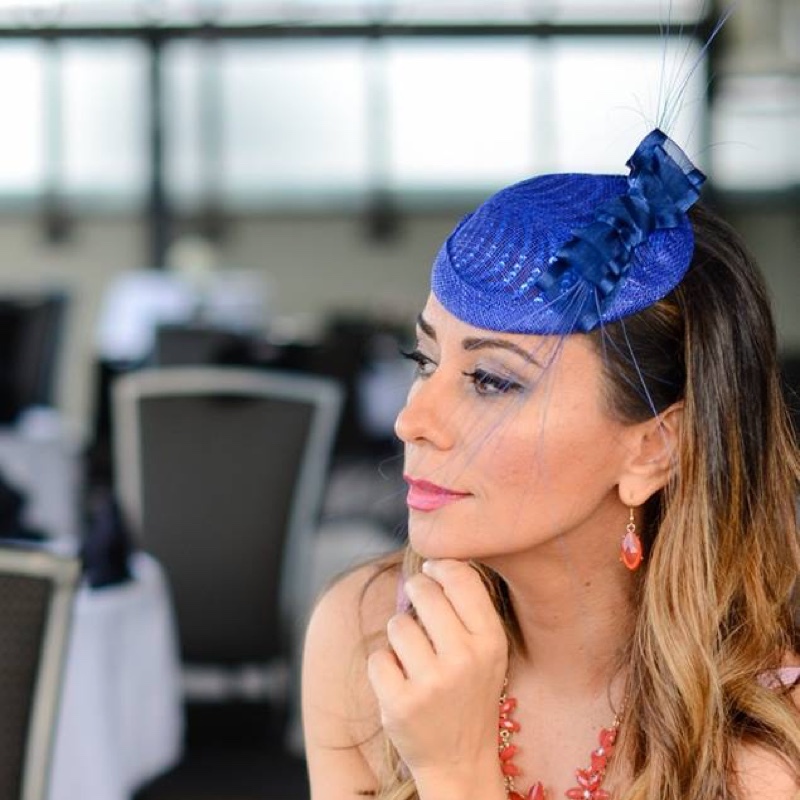 "If a woman rebels against high heeled shoes, she should take care to do it in a very smart hat." "I myself have 12 hats, and each one represents a different personality. Why just be yourself?" "Wearing a hat versus not wearing a hat is the difference between looking adequate and looking your best." "Life is like a new hat. You don't know if it suits you if you keep trying it on in front of your own mirror." "Women are vain. 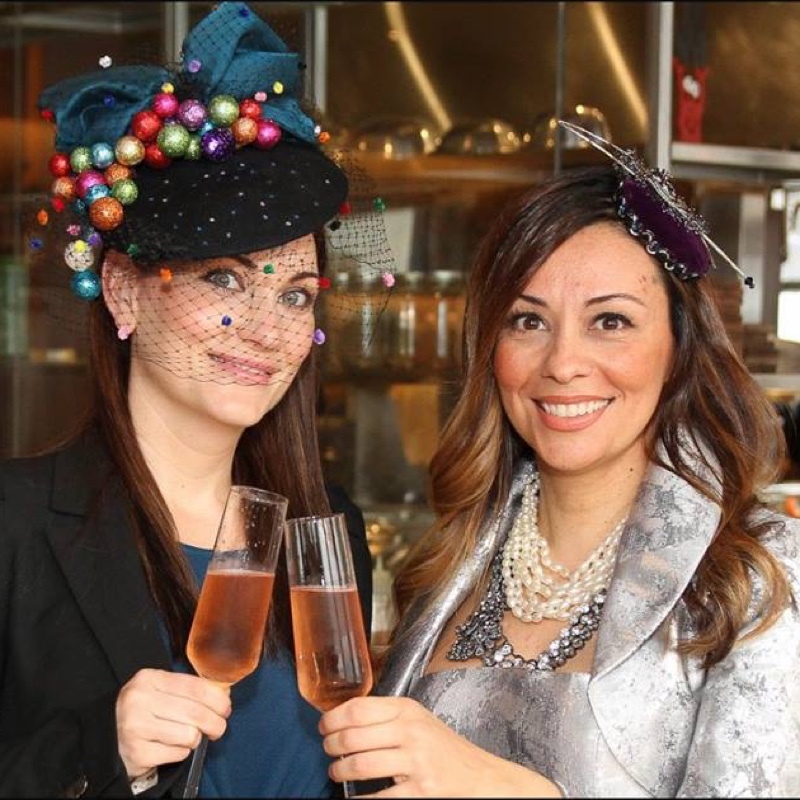 They think they look better in hats — if they have any sense."